Ainol is one of the Android tablet maker which manufactures the Android tablets in a good price, with the design being a bit like the Apple iPad Mini, though one cannot at all compare the pricing of the iPad Mini and the Android tablets made by Ainol. The Ainol Novo 8 Dream F1 is the new Android tablet made by Ainol, coming with the 8-inch capacitive touchscreen and an HD display, with the screen resolution of 1024 x 768 pixels. One of the best parts about this tablet device is the Quad-core processors which clocks at 1.5 GHz and it’s an A9 ARM processor included in the Dream F1 tablet device. 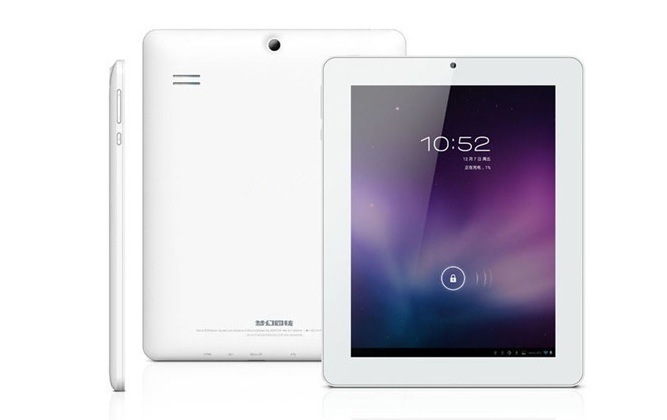 The sleek looking tablet device is 9.8mm thick, and weight 468gms which is decent for a device with 8-inch screen, and the front side of it looks like the Apple iPad Mini because of the front central camera in the portrait mode, but the home button is not given in the Ainol Novo 8 tablet. There’s Android 4.1 Jelly Bean operating system included in the phone, while apart from the fast processor there’s a GPU of Vivante GC1000. The Novo 8 Dream F1 has got a 2-megapixel camera on the rear side that lies just on the position where the front camera is located, thus making it again different from the iPad. The front camera is a 0.3 megapixel lens with the Android OS providing a good support for the video chatting the front cam, while this would look even better for the user with the display giving a visible viewing angle of 170-degree. The internal storage provided in the tablet device is 8GB and it can be expanded to 32GB using a MicroSD card. There’s a 6000 mAh battery included in the tablet and that would be good enough for the specs that are included. The connectivity is limited to Wi-Fi and the Micro-USB and there’s no 3G support through a SIM, but one could still connect to the Internet using the external 3G dongle, with the dongles that can be connected: E1916, ZTE AC2736, HUAWEI E1750, HUAWEI EC122, HUAWEI EM770W. The upgrade to the Android 4.2 is in works already, so one would be able to see that update available a few days after the tablet is out of the box, but the Android 4.1 won’t hurt much as that is just the generation previous to the latest one. All this comes for the price of US $150, and that’s a steal when you compare such specs and features with the other standard Android tablet devices from the well known brands around.